BILLY Castle says he’s “loving every minute” of his first year on the professional circuit. From losing in qualifying rounds in Barnsley to being treated like a celebrity in China, it’s been an eventful half season for the 25-year-old. Reflecting on one of the highlights, Castle said: “The trip to Shanghai was something special. “We were all treated like top celebrities. You couldn’t walk out of the hotel without people taking pictures of you. It was a bit mad. “I’m loving every minute of it, going to tournaments and you’ve got fans outside that you didn’t know you even have asking for your autograph. 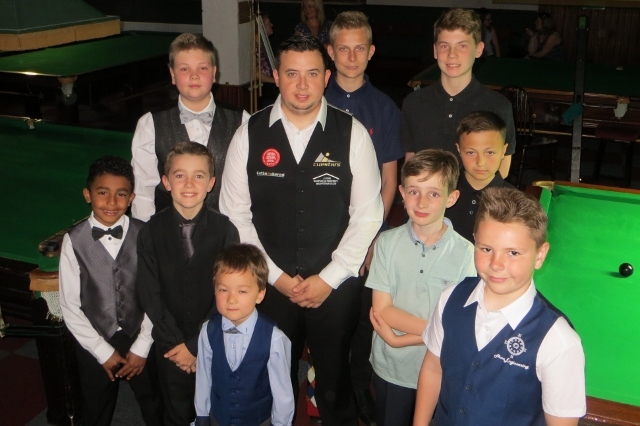 The reigning English Amateur Champion was talking during a visit to Chandlers Ford Snooker Club, where he had progressed through the Saturday morning junior leagues. He compiled seven breaks of 50 or more in 14 exhibition frames against the club’s current juniors and members of the Open Series, losing twice to Steven Hughes and once to Connor Benzey. During his first 13 tournaments on the World Snooker Tour, Castle has pocketed £10,500 prize money – not exactly enough to retire on but pretty good going for a rookie professional trying to find his feet. His target is doubling that sum by the end of the campaign. “(The season) started off a little bit slow because I was adjusting to it all,” he said. “It’s a different game. It’s one-chance snooker. It’s a lot tougher. I’ve had some ups and downs. I’ve had some good wins and some hard losses but I’ve learnt from all that. Castle said the high point of the season was coming back from 2-0 down to beat world number 17 Martin Gould 4-3 in the European Masters in Belgium. Three days later came the low point when he let slip a 2-0 lead and lost 4-3 to China’s Cao Yupeng in the last-16. Over the season so far, he has faced household names like Stuart Bingham, Jimmy White, Michael Holt, Neil Robertson, Ricky Walden and Joe Perry. But what about the pressure of performing in front of TV cameras? “It doesn’t bother me at all,” he insisted. “But if you miss or make a bad mistake, everyone knows about it. Castle has recently taken delivery of a Mercedes A-Class car, courtesy of his main sponsor, Neil Herd, boss of loft conversion firm Attic Life. And he also took time out to thank Cuestars director John Hunter, who helped arrange sponsorship for most of the events. Billy Castle (centre) and members of the under-19 league at Chandlers Ford SC.